This article demonstrates how to undertake a fracture mechanics assessment from the results of an ANSYS stress analysis for a large safety critical casting. During manufacturing of a large safety critical casting, there was a significant amount of porosity present in the main inlet pipe. This porosity was ground out and then replaced with weld material. Dye penetrant examination of repair layers revealed no surface breaking defects in the repair welds. Ultrasonic inspection after repair was capable of detecting near surface defects in the repair welds of about 6 mm extent through-wall. Therefore, initial crack sizes of 6mm, 9mm, and 12mm will be assessed to give a margin for error when inspecting the pipe section. 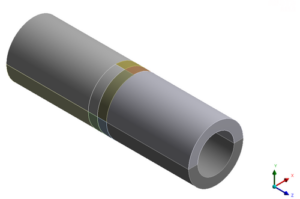 As this pipe section is a safety critical part (must be capable of withstanding 300 bar) and hence required a fracture mechanics analysis of postulated defects in the repair welds in order to demonstrate that such defects will not initiate using the Option 1 assessment curve of R6. Using ANSYS Professional NLS, the stress contours within the pipe were assessed. 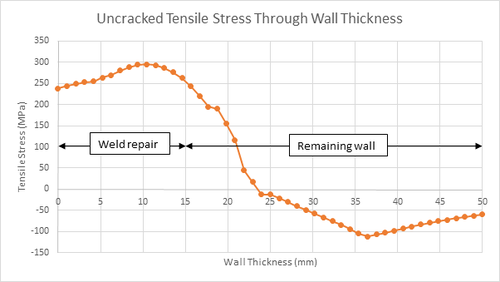 The image and graph below show the tensile stress distribution through the welded section and wall thickness. 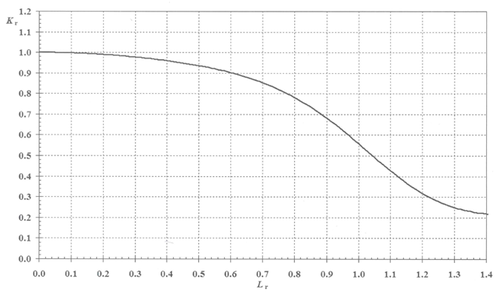 The stress level from the uncracked stress distribution was used to calculate the relevant stress intensity factor, K, for the proposed crack sizes. The crack was assumed to be a semi-elliptical surface defect with depth/length aspect ratio 0.3. 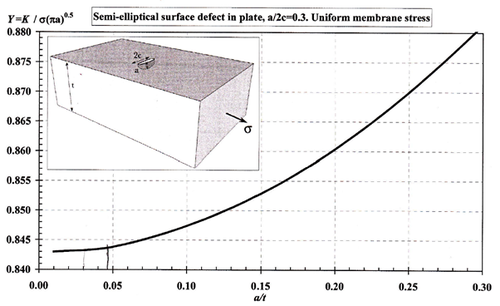 Based on an internal pressure of 300bar the membrane stress is 51MPa. 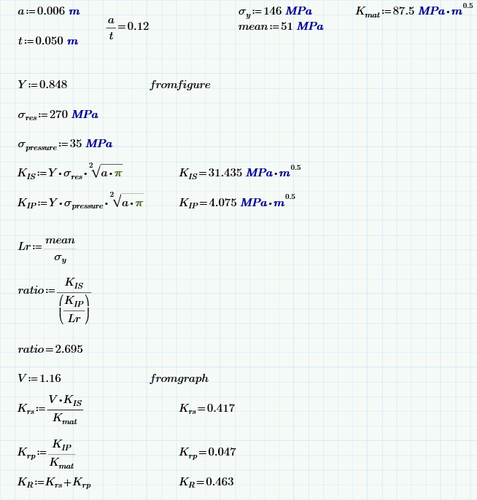 A number of other parameters were defined in order to calculate K. These are shown in the MathCAD sheet below. It should be noted that the calculated Lr value is an upper bound value and hence the calculation performed here is conservative. The above calculation is repeated for different crack sizes and the resulting assessment points were plotted on the R6 failure assessment diagram and assessed against the Option 1 failure assessment curve.